Using interest rate differentials to predict exchange rate movements is a good lesson in hubris. In 1997, the Bank of Canada's Board of Directors had one of their regional meetings in Quebec City, and as part of this exercise, local notables were invited to an off-the-record dinner with then-Governor Gordon Theissen and other Bank officials. Two places were set aside for Laval economics profs, and since I hadn't yet had the pleasure, I and another junior prof went. The Bank of Canada has made inflation targeting its central goal for the past few years. During that time, the CAD-USD exchange rate has declined, and our export sector has benefited greatly. But over the past few months, Canadian interest rates have fallen with respect to US rates, so it would appear that the exchange rate will start rising soon. Will the Bank allow the exchange rate to rise, even if it starts to hurt manufacturing exports? I don't think I'd be violating any rules of confidentiality if I reported that Mr Theissen's response was 'Yes'. I thought it was a good question, but as time went on, I was more and more pleased that the dinner was off the record. Instead of increasing, the CAD-USD exchange rate continued its downward trend for another four years. "In September, the CPI posted a 3.4% increase over September 2004." "On a monthly basis, the CPI All-items index rose by 0.9% in September. There have been only three increases of comparable magnitude over the past 15 years. Not since the introduction of the GST in January 1991, and the increase in tobacco and gasoline taxes in May 1989, has a monthly increase exceeded 0.9%." "Gasoline prices rose 34.7% and accounted for 1.5 percentage points of the 3.4% 12-month increase in the CPI." "For the past year, the 12-month change in the All-items index excluding energy has been between 1.4% and 1.7%." "[T]he All-items index excluding the eight volatile components as defined by the Bank of Canada remained stable. The 12-month percentage change remained at 1.7% in September and has not risen above 2% since December 2003. The Bank of Canada has shown that it's been willing to let CPI inflation drift temporarily outside the 1%-3% target for short periods of time while it absorbed temporary shocks: the most recent episode was in late 2002/early 2003, following a spike in energy prices and insurance premiums. In any case, it was already planning a series of rate hikes. But what's to be done about it? In a final sentence, he seemed to be advocating a radical policy initiative. "We probably have little choice except to be patient as we work to create the conditions in which a greater share of global saving can be redirected away from the United States and toward the rest of the world -- particularly the developing nations." That sounds like a prescription for strange policy from a U.S. Fed chairman -- one aimed at pushing investment "away from" the greatest economic engine in the world. Now, not everyone has to understand the relationship between trade flows and investment flows. But you'd hope that an economics columnist at a national newspaper would make the effort to try. What the workers need is Chapter 11 (subscription req'd): NAFTA's Chapter 11 allows corporations to sue governments for any policy change held to undermine their future profits (defined broadly as "expropriation"). Corporations have sued governments over everything from environmental regulations to postal delivery. Canada has been targeted the most. Here is the chapter is question, and here's how it's been applied. A quick look disposes of that last claim fairly quickly. If you discard notices to claim that were subsequently withdrawn, then Canada has been targeted the least. And even if you don't, we come in second. There's no reading of Chapter 11 that suggests that firms can sue the Canadian govt to compensate for a policy change that cost them profits; they have to show that they were treated worse than Canadian-based firms. That’s it. In 10 years, US corporations and their hordes of lawyers have managed to achieve precisely ONE victory under Chapter 11. That victory was the S.D. Meyers case. From what I can tell, this is exactly the sort of case that Chapter 11 was designed to deal with: a ministerial order that ran counter to what her own officials advised, but which served the interests of a Canadian competitor. Can anyone think of a good reason why PCBs should be sent 3500km from Toronto to Alberta for disposal instead of the 500km to Cleveland? Shaking the Chapter 11 Booga-Wooga StickTM is a widely-used rhetorical device. Speculating about why that is so appears to be a depressing exercise: one that I'll deal with another time. Our trade deficit is now roughly the size of the current account deficit, and very large relative to our export base. And our net investment income balances are now likely to move into deficit. It matters because of the trajectory of the U.S. imbalance. 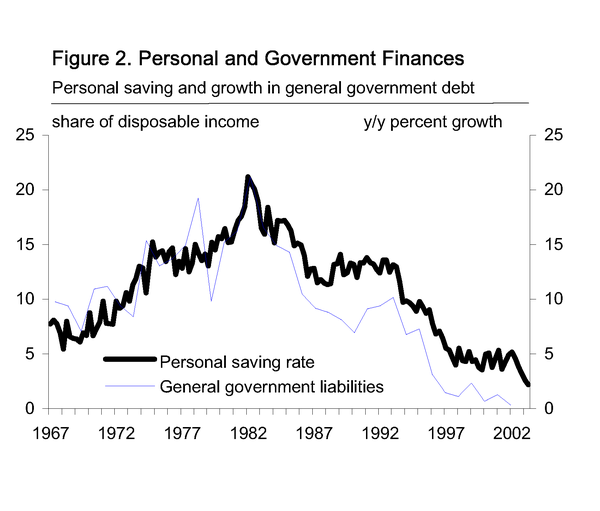 On reasonable assumptions about its likely near term path, this deficit will produce a very large net deterioration in our net external liabilities relative to national income, with progressively larger net transfers of income to the rest of the world. If this were any other country than the United States, we'd be scratching our heads, wondering why the investment balance didn't go negative some 15 years ago, when the US became a net debtor nation. It's really quite a trick: generating an income of 0.25% of GDP when you have a net investment position equal to -20% of GDP. In Canada, our net position is -14% of GDP, and we pay out just under 2% of our GDP on the investment balance. The Bank’s base-case outlook for output and inflation is subject to a number of risks and uncertainties. Over the next four to six quarters, these risks include the adjustment of the Canadian economy to global developments, uncertainty about the current level and future growth of potential output, and the evolution of energy prices. These short-term risks appear to be balanced. But as we look further out to 2007 and beyond, there are increasing risks that the unwinding of global economic imbalances could involve a period of weak global growth. In line with the Bank’s outlook, and given that the Canadian economy now appears to be operating at capacity, some further reduction of monetary stimulus will be required to maintain a balance between aggregate supply and demand over the next four to six quarters, and to keep inflation on target. However, with risks to the global outlook tilted to the downside as we look to 2007 and beyond, the Bank will monitor international developments particularly closely. As will we all. But until those risks start to manifest themselves, the Bank will continue raising interest rates to more neutral levels. So what do you do when you have an inflation target of between 1% and 3%, an economy running at capacity (unemployment is at a 30-year low, estimates for the output gap at zero), an overnight rate target of 2.75%, and 2.6% y/y CPI inflation? That's right. You raise interest rates. We already know that the 0.9% technical progress number is nothing to be proud about, and we could probably do better in the way of fixed business investment. What intrigues me is those last three terms. Offhand, I can't think of any real-world decision-making exercise where the point estimate is the only relevant piece of information. So why is it the only thing we see? The federal government has been running surpluses since 1997 (data available here), and these surpluses have been used to help drive Canada's debt-to-GDP ratio from 89% down to 44%. But now that we've retreated well back from the debt wall, Canadians are starting to wonder if surpluses are really what we want. After all, there are other things we can do with those surpluses, like increasing spending and/or reducing taxes; why is debt reduction the priority? It hasn't helped matters that the Department of Finance has - by all accounts - made it a practice of knowingly low-balling revenue estimates at the beginning of the fiscal year. The accounting rules say that at the end of the year, any surplus must be applied to the debt. The criticism is that when Finances underestimates revenues, it pre-empts any discussion about the merits of spending and/or tax cuts vs paying off the debt. I don't think Canadians are particularly opposed to the notion of budgetary prudence, and it could be argued (as I will in a minute) that what Finance is doing is in fact quite reasonable. The problem is that the discussion of the balance of risks and benefits is being held in the office towers at the intersection of O'Connor and Laurier, and not in its rightful place: the House of Commons. An enduring mystery of the Canadian economy is trying to figure out why the CAD-USD exchange rate is doing whatever it happens to be doing at any given moment. Notwithstanding popular opinion - an opinion that is all-too-often reinforced by commentators who should know better - the CAD-USD exchange rate isn't like a stock price, rising when the Canadian economy does well. In fact, the correlation between GDP growth and the exchange rate is generally negative, as a casual glance at this graph confirms (click for larger image). New Economist points us to a recent Bank of International Settlements study on productivity in OECD countries. The good news: Measures of productivity growth rates in Canada during 1995-2003 were about 0.5% higher than in 1986-1995. The disquieting comparison: The US improved its productivity growth rates by at least 1%. The puzzle: Notwithstanding the higher US productivity growth rates, Canadian GDP per capita went from 80% of US GDP per capita in 1995 to 86% in 2003. We're clearly not working smarter, so I guess we must be working harder. Everyone agrees that GDP is not the same thing as social welfare: economists learn this point early on in our principles courses. A more useful tool for policy analysis would be what we call a 'Social Welfare Function' (SWF): an index that increases when society as a whole is better off. Things like General Progress Indicators (GPI) - such as the one generated by GPI Atlantic - are attempts to construct SWFs. Those of us who remember our social choice theory will recall Arrow's Impossibility Theorem, which demonstrates that there is no way of generating a democratic, coherent social ordering. It also implies that there is no democratic, coherent SWF, either. In fact, that is the challenge, and it's insurmountable. I don't think that anyone would dispute the notion that (for example) the 22 indicators listed here are of interest. But after 30 minutes of rootling around that site, I still can’t find any description of how much of an increase in a given health indicator would be required to compensate for an increase in inequality, or how they would be balanced against a reduction in employment, let alone any justification for why that tradeoff is reasonable – or even why that tradeoff should be constant. ...Canada's index could eventually take the form of a report card rather than a single G.D.P.-like number. This is a much more sensible exercise. As an econometrician, I welcome new data sets, and especially ones that can be used to evaluate policy. But I'm very suspicious of any attempt to aggregate them into a single index. *Note: the kingdom in question is Bhutan, not Canada. But is Canada really stricken by Dutch disease and are we heading for a slump? Obviously, the Bank of Canada doesn't think so, as witnessed by this month's hike in interest rates and recent comments by Mr. Dodge and other bank officials. The exchange rate bottomed out at around 0.625 USD in January, 2002, and since then, it’s gone up by over a third to trade at 0.85 USD in recent days. Should the Bank be worried? Manufacturing hours have held steady at around 85m hrs/week since January 2002, the same level we saw in the 24 preceding months. Exports of finished goods in 2004 were 5% higher than they were in 2001, when the CAD was trading under 0.65 USD. Unemployment is at 6.8%, a level we haven’t seen in a more than a generation. The employment rate is around 72.5%, just under the record of 72.7% set last year. So no, Canada doesn’t have the Dutch disease. But at 0.85 USD, the exchange rate is now above the IMF estimates for the purchasing power parity (PPP) rate. David Dodge may want to keep a box of tissue handy. Where did that current account surplus come from, anyway? As I noted earlier, Canada is the only G7 country that is running current account and government balance surpluses these days. The story behind the government surplus is of course well-known, and will probably be the subject of another post. But what about that current account surplus? A cursory look at the data suggests a plausible answer: The current account balance is 2% of GDP, and energy exports have increased by 2% of GDP over the past few years. Conclusion: oil and natural gas exports explain the current account surplus. It turns out that this answer is less than half right - but that the energy sector deserves the extra attention anyway. Mark Thoma of Economist's View is unconvinced by the optimistic tone of The Economist's article on the shift from manufacturing in rich countries. As he notes in his comments page, he's aware of the gains from trade, but he's also concerned with the welfare of those who lose. That's a sentiment I share. ...[T]he line between manufacturing and services is blurred. McDonald's counts as a service company, but a visit to any of its restaurants puts one in mind of an industrial assembly line, turning out cooked meat products. Similarly, an increasing slice of value-added in manufacturing consists of service activities, such as design, marketing, finance and after-sales support. Last but not least, Britain's number-crunchers stick The Economist, along with the whole publishing and printing industry, in manufacturing, even though almost all our staff are engaged in service-like activities. The division between manufacturing and services has become redundant. A more sensible split now is between low-skilled and high-skilled jobs. Statistics Canada has data on employment and wages by occupation - what can they tell us?